For telemedicine trailblazer Robert Groves, MD, his first recollection of the technology is an illustration in a 1950s magazine article showing a little boy interacting with a physician over a video screen. 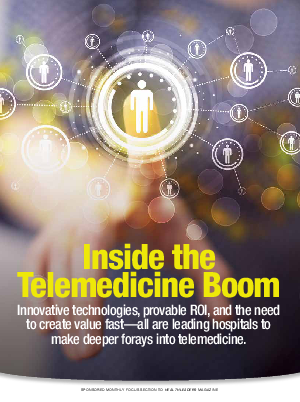 Most of telemedicine’s history, says Groves, “has been that model, that on-demand, limited time-frame interaction that facilitates both trust between the parties and the ability of the provider to assess the patient more than they would be able to by a telephone conversation.” Today, however, Groves oversees a telemedicine program that is a “radical departure” from this early vision. As vice president of health management at Banner Health, a nonprofit healthcare delivery system based in Phoenix, Groves runs a teleICU program that enables physicians and other clinicians to remotely monitor critical care units hundreds of miles away. Introduced nine years ago, the technology has done more than just provide telemedicine consults between board-certified intensivists and providers in far-flung outposts: It has changed the way the system delivers critical care services.